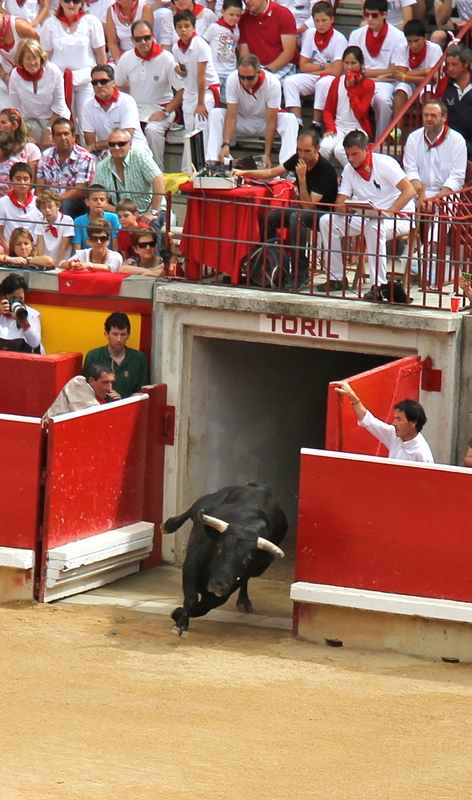 A Dolores Aguire bull, the third bull to be killed that day, has a lingering death with Joselilla and his cuadrilla during the first bullfight of the 2012 San Fermin festival. Even though it took some time for the bull to die, Joselillo was awarded an ear from this bull as a trophy for a good fight. The Spanish word for bullfight is “corrida de toros” which translates to “running of bulls.” It is not called a fight because it is not set up to be a fair competition, where man and bull compete on equal terms. 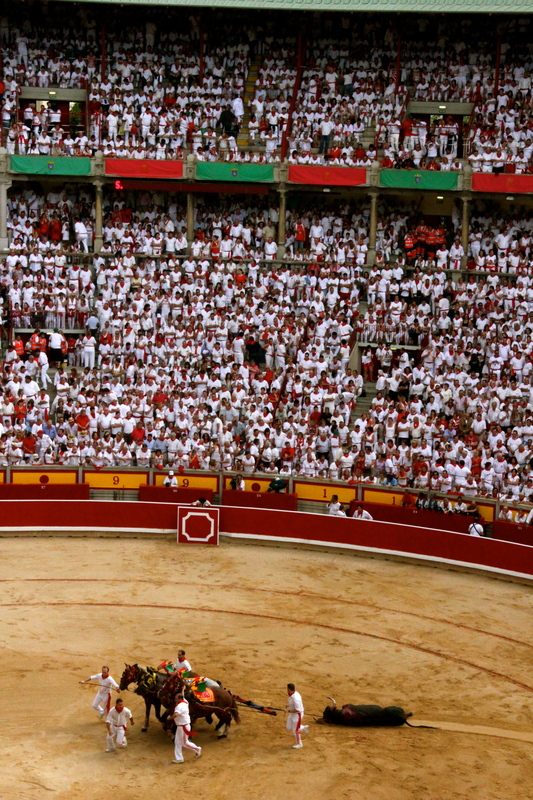 A corrida is considered an aesthetic and tragic event in three acts, similar to an opera. 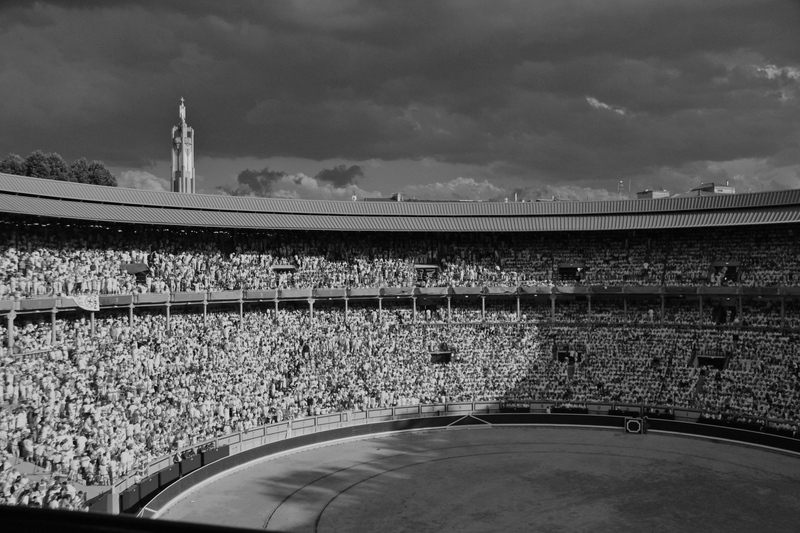 I attended my first bullfight in Pamplona, Spain where I bought a scalped ticket for 30 Euros with two U.S. Air Force pilots I had met that evening for the first bullfight of the festival. Our seats were in “sombra” or the shady section of the arena as opposed to the “sol” or sunny section. Tickets are always divided into “sombra” or “sol”—sombra, being the shady and desirable seats and the sol section receiving most of the direct sun. Understandably, the sol section has the cheapest tickets. Sol and sombre, sun and shade, are important features of the corrida and are said to add drama to the event. Because of the overly festive atmosphere of the San Fermin festival, Pamplona’s bullfights were somewhat different than other bullfights in Spain. The sol section is occupied by Peñas, San Fermin’s social clubs, each with their own brass band. The bands parade through the streets before and after the fights and all play Pasadobles, the historic music of matadors and flamenco dancers, and provides the soundtrack for key moments during a bullfight. Because the sol section is the party section, the emphasis is on the enjoyment of the party and less on the bullfight itself. The sombra section is full of older, more subdued locals and bull aficionados—connoisseurs and experts of the sport. I was happy to settle in on my small portion of the concrete seating in the shade, surrounded by quiet residents of Pamplona and my new friends. In the sol section partiers were pouring sangria over each other and reveling in the festive atmosphere of the day, surrounded by a cacophony of brass bands. 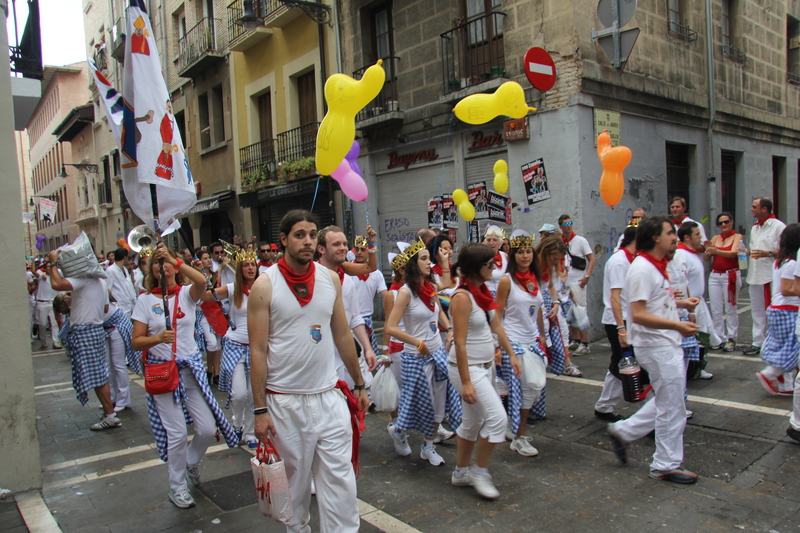 A Peña, one of the social clubs of Pamplona, making its way to the bullring for the first corrida of the festival. Edwardo Gallo working his capenado on a Dolores Aquire Bull. Act One is called Tercio de Varas or “trial of lances.” During this act the matador does not encounter the bull, instead first phase of the bull’s physical torment is conducted by “picadors.” These are mounted bullfighters that ride blindfolded horses and carry staffs equip with short lances on the end. At this point the bull is at its full strength and must first be worn down so that it focuses its attention on one enemy and it is physically tormented in a way that its head will be lowered, both so it can be caped without hitting the matador in the face with its horns (during the third and final “act”) and it head is down so that the shoulders will be low and open allowing the sword to go in for the final kill. I was unable to get a good image of this part of the bullfight as I was not able to get a good photo from the seats I had at this bullfight. To watch a video of a bull charging a picador and his horse, click here. When separated from its herd a bull’s main instinct is to charge. When left alone with a picador the bull is supposed to charge the horse, which allows the picador to cut the bull on its morilla, the muscular mass behind its neck and above its shoulders. If the bull does not charge the horse on its own, assistants with capes direct the bull’s attention to the horse. If successful, the bull will come close enough for the picador to use his lance to make his cuts. Cutting the morilla will begin the bleeding of the bull, cause the bull to lower its head and also to become enraged. In the past horses were often killed when the bull charged it when the bull crashed into the horse’s side and goring it. After 1928 horses had to be outfitted with heavy padding and while many are injured it is not as deadly for the horse as it was in the past. Nor does the crowd see the injuries the bull incurs when the horse is covered. This is an image of a bandellero a moment before he places the bandilleras at a novillero, a novice bullfight. When the picadors are finished with their lances, the “second act” begins called the tercio de banderillas”. The banderillo is the man who will place bandelliras—long sticks decorated with colored paper that end in a barbed metal point—into the bull’s morilla. Banderillas will continue to aggravate the already bleeding bull. The banderillo does this by placing the banderillas in the back of the bull’s neck in pairs when the bull charges him and jumps out of the path of the bull at the last moment. The objective is to focus the bull’s rage at a single man and tire the bull and focus its energy so the bull will execute passes and allow the matador to show off his bravery, “artistry” and skill before he finally kills the bull. In order to accomplish this without thoroughly tiring the bull, the bandalliro may not place all six banderillas that he is allowed to use during this phase of the fight. 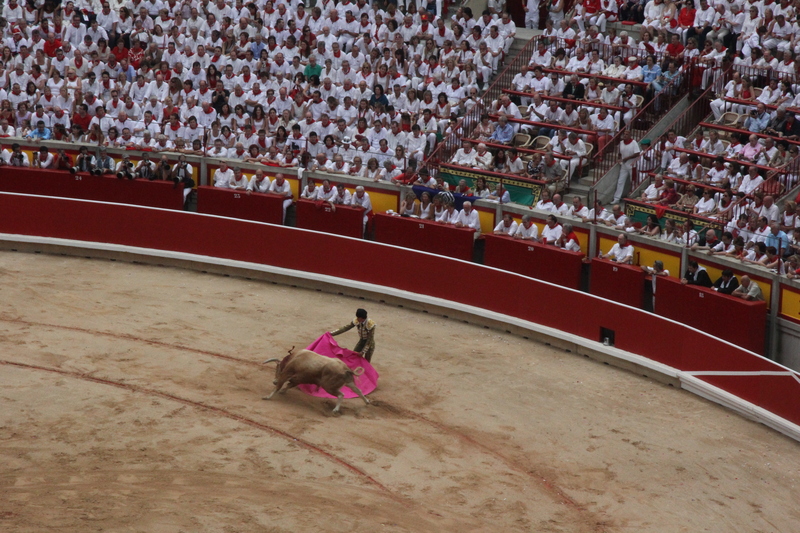 Sometimes a matador will act as banderillo and matador, but normally the matador’s role happens in the third act, caping the bull and finally killing it. A banderillo’s job is very dangerous, and are as vulnerable to injury or death as a matador. For this reason some banderillos are famous in their own right. Once the banderilla2s have been placed the matador is ready to enter. A matador is dressed in a Trajes de Luces, which translates to “suit of light”, and is a tight silk suit elaborately embroidered with sequins. The suit is tailored to be tight on the matador’s body so that a horn won’t carelessly catch the fabric. The Traces de Luces is accompanied by tight pink silk tights, slippers, and a felted hat. The matador usually removes the hat before he begins his confrontation with the bull. The red cape, called a muleta, and a wooden sword are the only weapons he has to “fight” the bull with and the matador uses the cape to entice the bull to charge him repeatedly. There are several names for the different moves used during cape work. In order to entice the bull to charge and also be able to be artistic with his body and cape work, a matador has expert knowledge of a bull’s physiology and behavior. The matador knows where the blind spots are because of the bull’s anatomical make up. He or she will also know the bulls breeding and the typical behaviors that a bull should exhibit given its breeding. Not all bulls will display the desired behavior and the crowd has high expectations for both a matador’s and a bull’s behavior in the arena. A matador must be able to size a bull up and encourage it to charge so that he or she can execute a series of artful passes with the cape. If the bullfighter is doing well, people in the crowd yell “toro”, and if the fight is going badly a matador and bull will often be heckled by the crowd. If things aren’t going well angry whistles emanate through the crowd, signifying cowardice of bull or matador. At this point a bull has lost a significant amount of blood and will be nearing exhaustion, its sides heaving from being injured and exhausted and many bulls have tongues hanging from their open mouths. 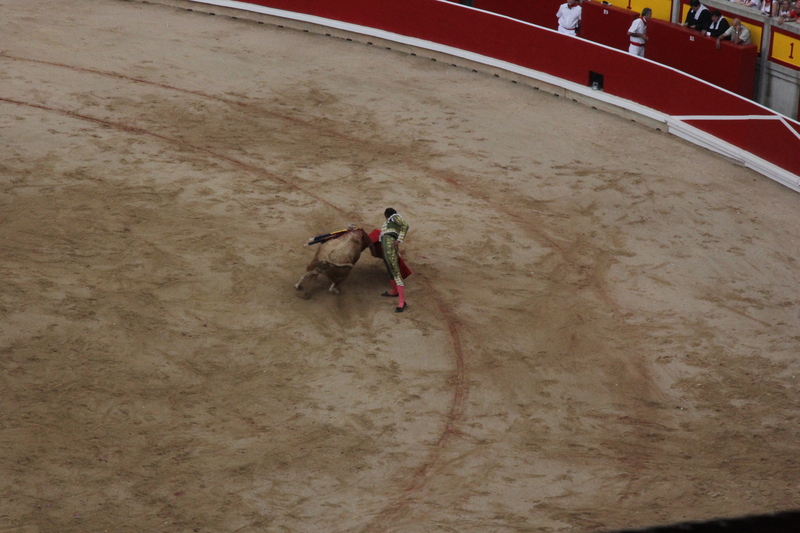 The matador must determine when the bull will have had enough passes and still want to charge the matador for the death kill. 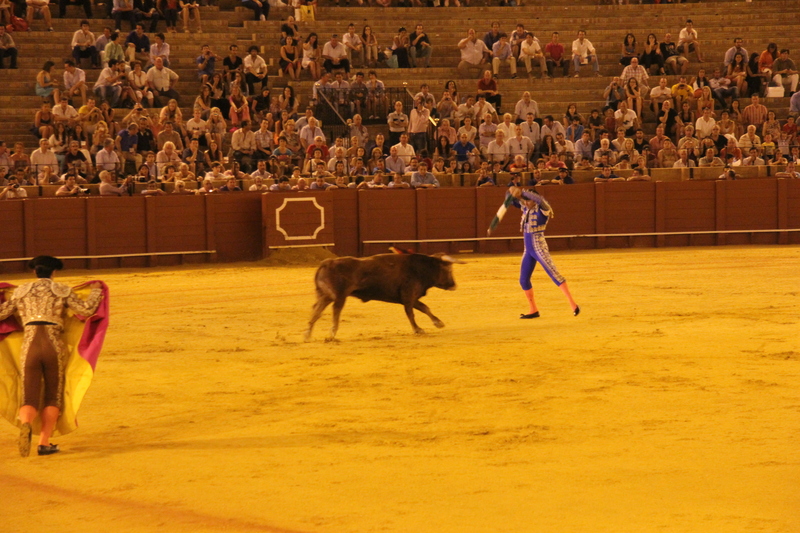 At this moment the matador changes out the wooden sword with a metal one. When the bull does his final charge the matador is supposed to insert the sword between the bull’s shoulder blades as bull leaps into the air so that it will kill it quickly. If the sword does not kill the bull, the matador must remove it and try again, but if it looks like the sword thrust was fatal then the matador is given another tool to sever the bull’s spine with and kill it “cleanly.” It also happens that the sword hits bone and bounces off the bull and the matador must make it charge again until the bull is killed. It is not unusual that the bull will live for a few minutes while encouraged to walk in a circle by the matador and his assistants until the sword strikes a vital artery and the bull drops to its knees. At that time it is acceptable to dispatch of the bull by severing the animals spine. If it has been determined that it was a good or great fight a matador will be given one or more mementos of the bull, either one or both ears, a hoof or the tail. Only one ear was given on July 7th, 2012 out of the six bulls fought, and that was by Joselillo from a Dolores Aguire bred bull. The awards given to the matador are determined by the president of the match. The president also has the power to pardon a bull at the crowd’s request if the bull exhibits extreme “bravery,” but this a very rare occurrence. 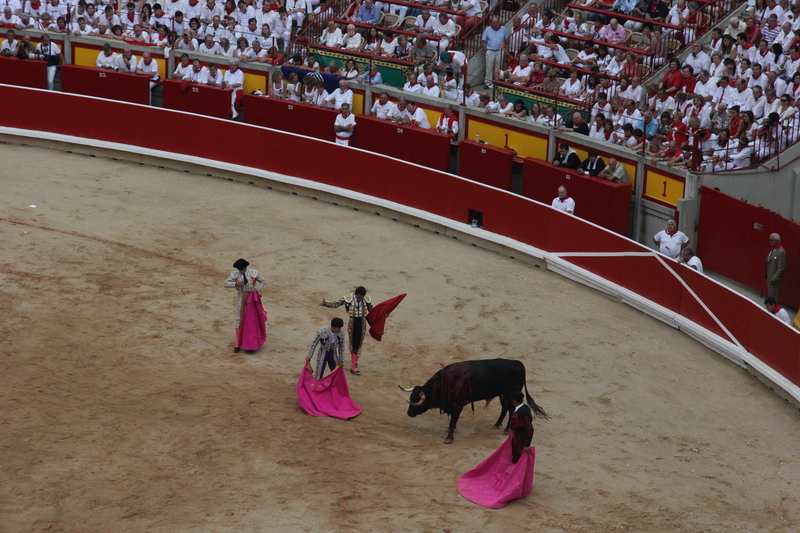 In most cases, the three matadors kill two bulls a piece during a standard corrida. 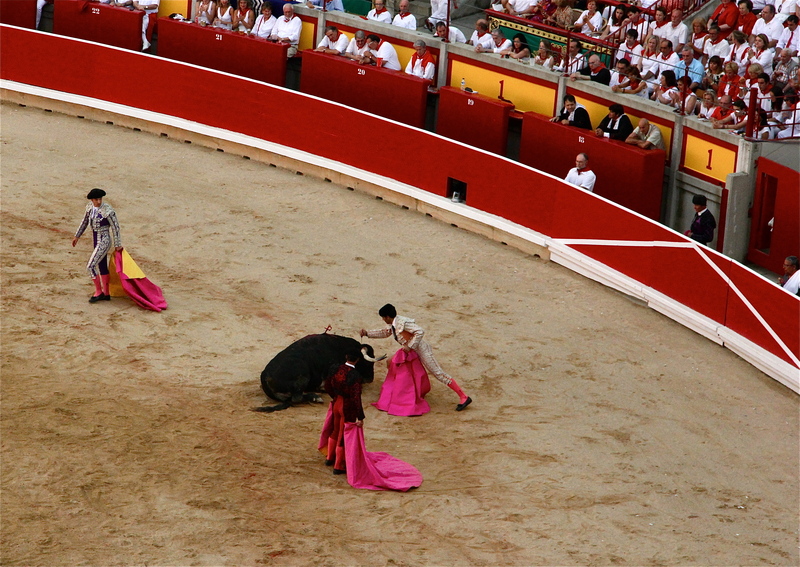 If one matador is so severely injured that he must leave the ring, one of the other matadors will kill his remaining bull(s). Because I did some research before I went to Spain, I knew most of this information before I went to the bullfight, but my two friends from the Air Force didn’t know anything about bullfighting before this corrida. I’m concerned about animal welfare, so I was pretty certain I would dislike watching the bullfight, but I was a little surprised by the strong reaction from the two American men I watched the fight with. They were very upset by the event, mainly because it wasn’t a “fair fight.” While many images of bullfighting that appear in the popular press show one man against one bull, in reality there are many people involved in the fight and ready to assist the matador if he gets into trouble. The pilots were very angry about the event, because the bull was outnumbered, but also because most of the bulls visibly suffered. Only one bull was killed swiftly, the other bulls’ deaths were not ended quickly. Either the matador had to make several attempts to insert their sword into the bull, or the sword did not hit a vital organ or artery and had to be encouraged to walk in circles before it was ready to drop to the ground. Even for these military men it was difficult to watch. 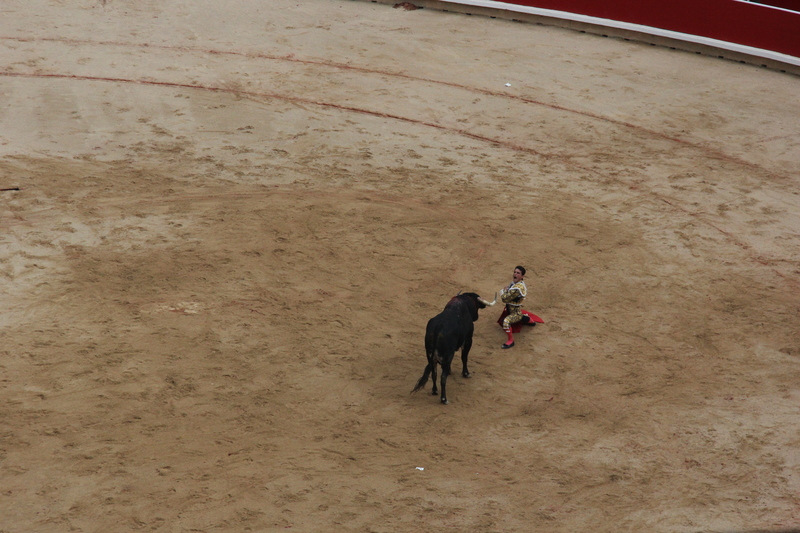 One of the men proclaimed that watching the bullfight made him want to, “become the president of PETA,” which came as a big surprise to me as we had noticeably different political ideologies, but we all shared the same feelings about the bullfight we had just witnessed. …be diminished to this in the course of 20 minutes. Aficionados would say that the novice spectator misses the aesthetic properties of the bullfight, the grace and fearlessness of a skilled matador that can make a dangerous situation look like a choreographed ballet step. The beauty is supposed to be in the cape work, how the matador reads the bull and gets the bull to perform passes and how close the matador is to the bull’s horns while controlling his own body and emotions. While all of these things do take skill, it was difficult to ignore the brutality of the event and the fact that it is a very decadent and in my opinion unnecessary form of animal death. This entry was posted in Spain and tagged Animal Welfare, Bullfighting, Festivals, Spain, Travel. Bookmark the permalink. The bull is not always killed however. The president of the corrida, the audience, or the ganadero, can intercede to save the bull. One thing most people don’t know is that a bull is only ever fought once, so the arena is the only place a bull’s full and best characteristics will ever be seen. From his performance the decision of whether he will live or die will be made. When we were more agriculturally aware, audiences knew how to assess the animal, to judge whether or not it should continue to become beef or whether it should be kept for breeding — i.e. become a stud bull. It’s very sad today that toreo has become a money-making spectacle in front of an ignorant audience. The spectators no longer know how to judge what makes a bull exceptional. Hint: It’s not viciousness or its ability to harm a matador. In fact, if a bull harms a matador it’s *more* likely to be killed. They also don’t know when a matador is making sham movements that are only flashy and not skillful at all. In smaller, more rural communities, a more classical understanding still lives. The matador’s job is *actually* to present the best features of the bull — like how a male dancer shows off his female partner — so that it can be properly judged. A matador should never disrespect the bull — but many today unfortunately do, and the spectators don’t realize it. In the end, while agreeing with you about animal welfare, I wonder which is better — for such an amazing animal, half a ton of muscle and horn, no fat, to be allowed to show show his cojones in front of an audience that might see his exceptional characteristics and vote to preserve him? Or to simply and secretly get sent down a sterile chute at an abattoir to get a bullet in the head without anybody ever witnessing his magnificence. I think of this as the ultimate “man to man” question. Would a human man prefer to just be sent away silently into a sterile chute to die? Or would a human man prefer to show his all in front of others in a bid to possibly live even if the odds of dying were high? 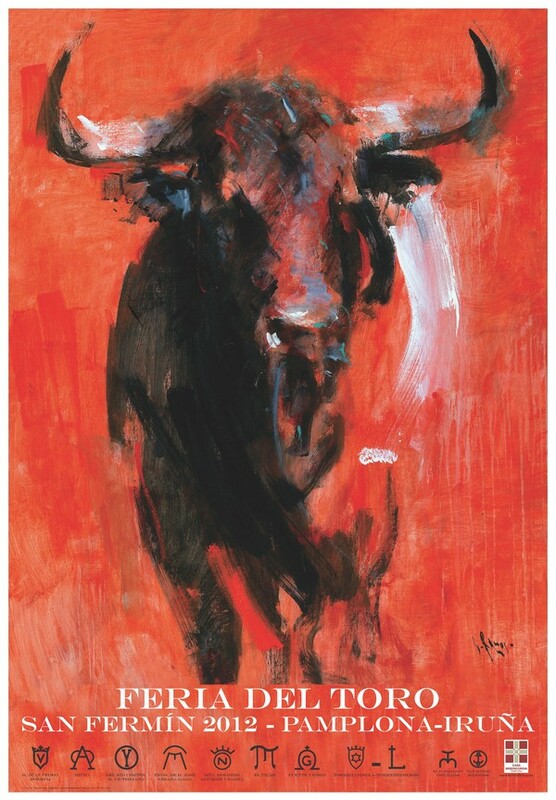 This is why the bull should always be respected — never touched, never slapped — because he is there to show his all, and the matador’s job is to help him do that, to dance with him in the tercio, in the lydia, and then, presuming no indulto (intercession), to deliver the coup de grace. In its highest form, respect for the bull is embodied in the matador dressing up to get into the ring and risk his own life in an attempt to kill it by hand. Because face it, there’s no honor in abusing a captive animal, and there are much easier ways to be successful at killing a bull if that’s your main goal. So the only reason a corrida exists as it does is to show respect for the bulls, and to help them present their cojones. A corrida is definitely hard to watch, but when I see one today I am struck by the nakedness of the matador’s character — is he arrogant, is he respectful, is he humble, etc? The bulls are constant, their variations subtle but perceptible. But the men vary widely, and their characters are nakedly visible in the ring. Both man and bull in a corrida are judged by their characteristics, but the bull, being property and having no choices, is due the greater respect. When the matador forgets that, that’s the abomination in my opinion. We modern people just don’t know these things. And sadly however, as both our love of money and our agricultural ignorance have grown, we’ve lost the ability to see what should be happening and to measure it against what is happening. We’ve become so “cartoonified” that we imagine matadors are always in danger (they’re not), always triumphant (they’re not), and that the bull is simply a victim of abuse, not tested. We’ve also become so “cartoonified” that children think hamburger comes from either McDonalds or from under plastic wrap at the supermarket. And I suggest it’s more honest, and respectful, to choose to witness the death of an animal I eat rather than wish it away and pretend it isn’t real. 2.) I also agree with you that until the corrida fighting bulls have overall better welfare than cattle being raised in industrial agriculture. Does this justify their violent drawn out death? I have doubts. 3.) It is my understanding that pardoning a bull is very rare and the odds of a bull being killed in a fight are 99% certain. “Tested” bulls rarely pass on their genetic lineage. 4.) Bulls are only fought once out of danger to the matador and probably not respect for the bull. Aggression/courage/cojones are also tested on young females on the breeding ranches. If they display the “correct” attributes of cajones then they will be kept for breeding. This is one of the purposes of the vacarilla. 5.) There is nothing necessary about the practice of breeding cattle to act aggressively. Stud bulls in other breeds are assessed by different criteria than courage or as you say, cojones. Some cattle breeds, like dairy breeds, are chosen for docility. Maybe at one time Spanish bulls needed to defend their herds from predators, but I don’t see any reason for bulls to be selected for this level of aggression other than to perform in the corrida at this historical time. Though, fighting cattle breeds have been used for cattle used in rewilding projects, for hearty cattle that can survive well with limited human intervention. 6.) In “Animals in Translation” animal scientist Temple Grandin suggests that female cattle that are the most aggressive also display the most fear behavior. It might be behavior that is highly fearful may be interpreted as courage or bravery because humans want cattle to display these categories that we use to assess human behavior, but are culturally defined. More research needs to be conducted around this area of cattle behavior. 7.) I think we have different ideas about what “respecting an animal” means. Bulls kept in herds on the open rarely fight to the death, so I doubt that this is the kind of death that cattle hope for. I think I’m curious about why humans create these conditions in the first place? What does the corrida fulfill in the human psyche? Mastery over animals or nature? A display of masculine prowess? A connection to ritual animal sacrifice from past times? 8.) Thank you for sharing your point of view regarding the corrida. I very much appreciate your perspective on this issue and value your comments even if I have a different perspective about this issue. Animal husbandry has much more commonly bred aggressiveness OUT of cattle, for the convenience of man. The ganaderos claim that they breed bulls for the corrida to be closest to the original, wild genus Bos. It would be hard to prove this to be so, but considering that they keep strict genealogy on these animals, with notes, back into the 1700s and further in some cases, they do at least have observations that are centuries old to compare new generations against. In fact, the storied Muira bulls did end up with a variation that made them too vicious. Eventually the ganaderos diluted that strain again as too far from the original. Much of this is subjective however, but certainly the large population of domestic bulls are widely known to have been bred to be larger (more meat) and more docile (less dangerous). Knowing something of toreo however, it’s not quite correct to say that we’re trying to increase or provoke ‘aggressive’ or ‘vicious’ behaviour. Toreros work with what’s called “juridiction” — an elastic zone around the bull which, if nothing enters, the bull will not react, but if something enters (like the flutter of a cape), it will charge at it. The characteristic is thus protectiveness (bravery) — not viciousness. What a torero is actually doing is gradually, through the lydia, shrinking the jurisdiction enough to get closer and closer to the animal — again to be able to kill it quickly by hand. This is also how you can tell when a torero is doing false and flashy but non-dangerous moves. He can look so macho!! But he’s often standing well outside the jurisdiction so it’s a bunch of baloney. As far as the females, the mythology says that the characteristic if bravery runs through the female line (of course I like that!). And again who knows, but considering the long geneaologies, with notes, it’s not hard to think it might be true. What female isn’t protective!! So yes, the females are also judged, often in a tienta, where a full-fledged matador tests them afresh and once the decision is made about whether she’ll be kept for breeding, students of “toreo practico” can then practice with her. And yes, bulls are only ever fought once, mostly because it would be dangerous to the humans — because they learn quickly and eventually would figure out that charging a piece of fabric inside the jurisdiction is fruitless and they would start going for the human’s feet, legs and torso. Still, I hope you don’t get me wrong. I’m not necessarily defending toreo, especially its modern moneymaking version in front of ignorant audiences. But I do think an informed look at all these things is useful, from all perspectives. And the question remains — is it better to mechanize death and sterilize it away from our perception? Is it better for a magnificent animal to simply get whisked away and slaughtered in that industrial environment where no one ever sees its magnificence? Or might it be worthy for a human to honor the animal by facing it, and risking their own life to kill it by hand in front of a witnessing community? Different people are going to come down differently on this question. My view is that we are losing touch with the natural world and that soon the forces of automation will have everything automated so that we don’t have to actually feel or struggle with feelings anymore at all. I’ve seen abominable kills, really awful ones where the presidente should have stopped it sooner and let the puntillero finish the bull quickly. At those times I’ve been sickened — unlike other, more comfortable times when the bull drops immediately. But it’s at those disturbing times that I also reflect on how no human death is guaranteed to be clean, easy and painless either, as much as we might try to make it so. Until, I guess, we achieve our automated industrial nirvana and can go, at will, to check ourselves in at our local euthanasia center before ever having to face a painful maiming or bloody death of our own. Again, I do not relish blood or death, but I do appreciate the lower technology and honest, natural risk in toreo. Just strip away the BS money-making spectacle and take it back to rural communities and I’d be fine.